Steven (Chicagoland, United States) on 4 August 2015 in Plant & Nature and Portfolio. Photo captured August 1, 2015. Woooooo, comme un joli jupon froissé. Ma couleur préférée. Belle lumière. Quelle macro ce coeur de fleur et ce rouge fantastique cpatage. Nice close up, blazing color! Splendid framing ! Very beautiful ! A marvelous splash of red makes this image very eye-catching. Nice detail of the flower's heart. Wonderful reds and superb focus on the details. Une de mais fleur préférer, nice close up. Lovely color and texture; well-placed center of interest. Beautifully composed! This is just phenomenal. I love the bright red! Wonderful detail! 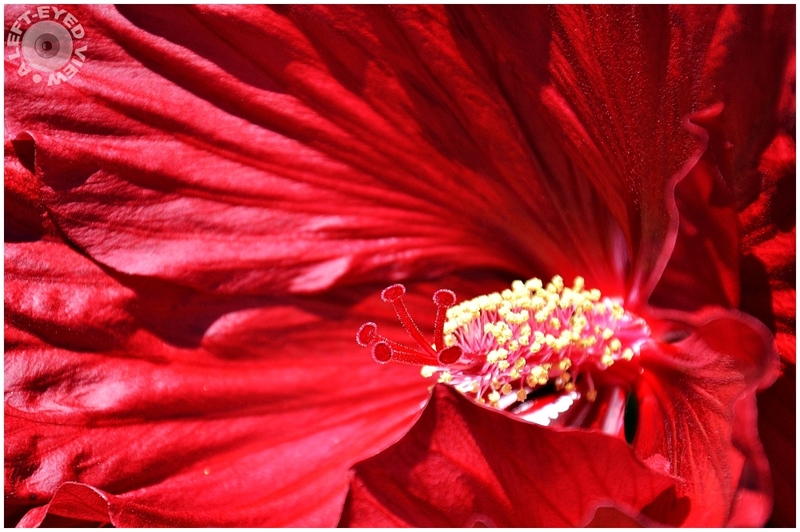 When I was really young we lived in Hawaii and there were hibiscus everywhere. I never really appreciated them then. I've never seen a red Hibiscus.... I have the white/pink and I used to have a white one in the backyard but it died a few years back. I love this macro... color/details are superb. That certainly is a beauty. Hibiscus are so delicate looking. Fabulous macro ... the details, the texture of the petals and the colors are wonderful !!! I like how the red petals seem to billow out behind the stamens.